The bathroom is usually the smallest room in the house, but the next to the kitchen, the most used! It can be hard to keep it organized in such a way that family members put things away when they are done. If there is a place for everything then it makes it easier on cleaning day too! If you vanity area is not very big or maybe you have a pedestal sink and there is no counter, then you need some creative storage that takes advantage of every nook and cranny and corner and yet looks good. Below are a few great affordable bathroom organization ideas that will help deal with clutter. One of the hardest things to keep organized is makeup! 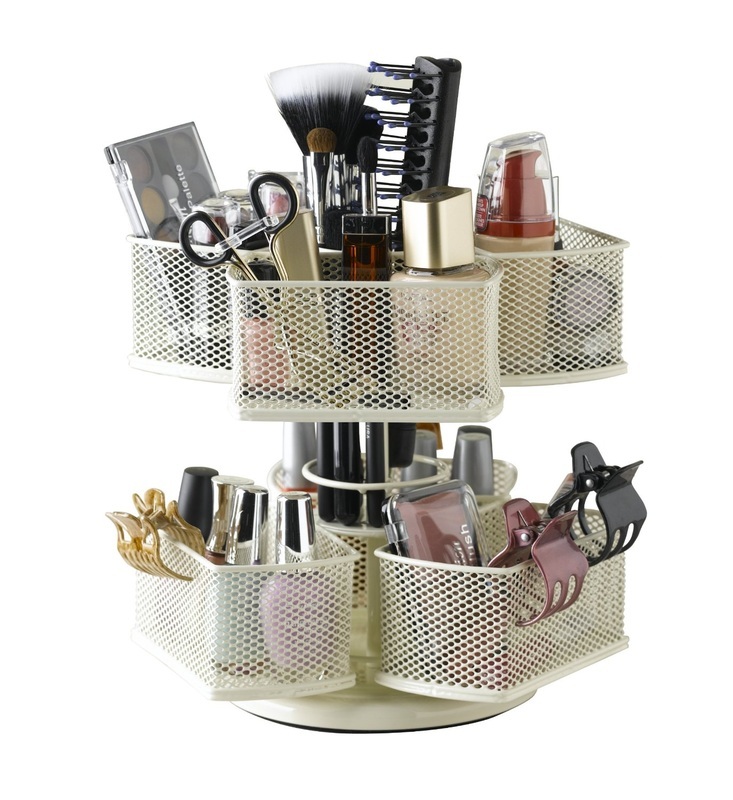 usually you are in a hurry and it ends up in the sink or on the floor, but this is the perfect makeup storage or cosmetic organizer. It turns so you can find what you need quickly and it only takes up a small area on your vanity. It totally rotates and there a lots of little baskets to store everything. You will be surprised how much can actually fit in here and your vanity will be clean! 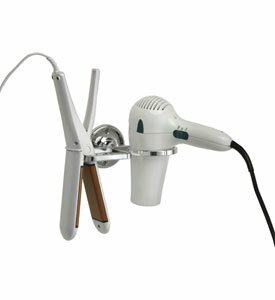 This is a much safer way to store your hair dryer and curling iron. No more burnt counters and electrical cords in the sink! This is a wall mounted hair dryer holder but it also holds your curling iron or other appliances to keep your bathroom organized. This was always one of my pet peeves in my bathroom, as I would find the blow dryer on the toilet or in the sink! This keeps everything out of the way and safe and yet easy to grab again. If you are trying to come up with good looking bathroom storage ideas, don't forget the wall. The most common area is over the toilet. 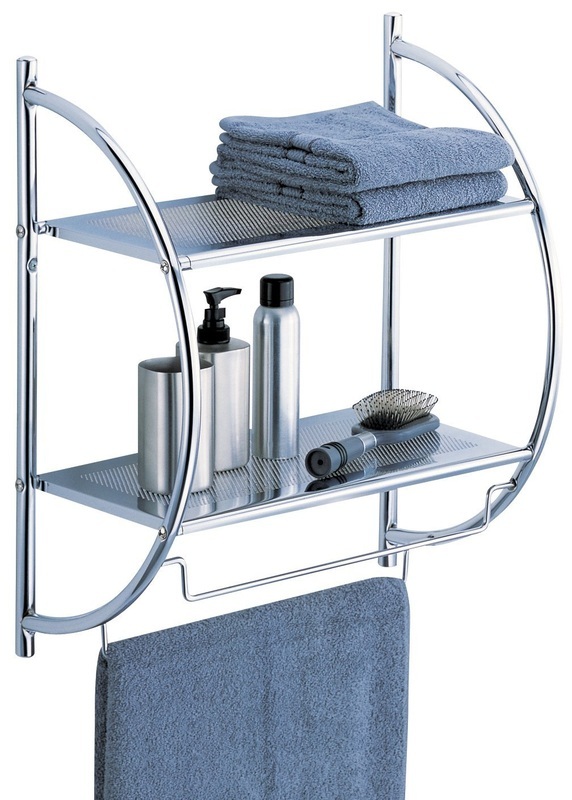 If you have some wall space you can purchase good looking chrome shelf units that can hold all your towels. Over the toilet storage can house almost everything you need in the bathroom. It is a great way to display your towels in your bathroom colours or use for other products. There are even two places to hang towels underneath, which would be handy for getting out of the shower. This is a really nice bath accessory that has adjustable shelves to accomodate different sized bottles. 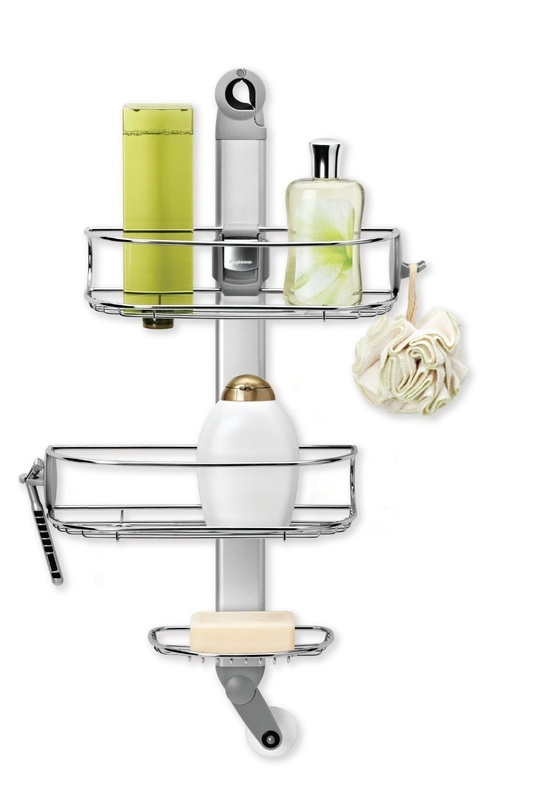 The shower caddy has rubberized clamps for a good hold on the shower head and then suction cups for extra strength. It can be pivoted to make it easier to use. Get rid of all the shampoo and conditioner bottles at the sides of the tubs, which makes it look messy and harder to clean. The more bathroom storage areas you have the easier it will be to clean your bathroom. 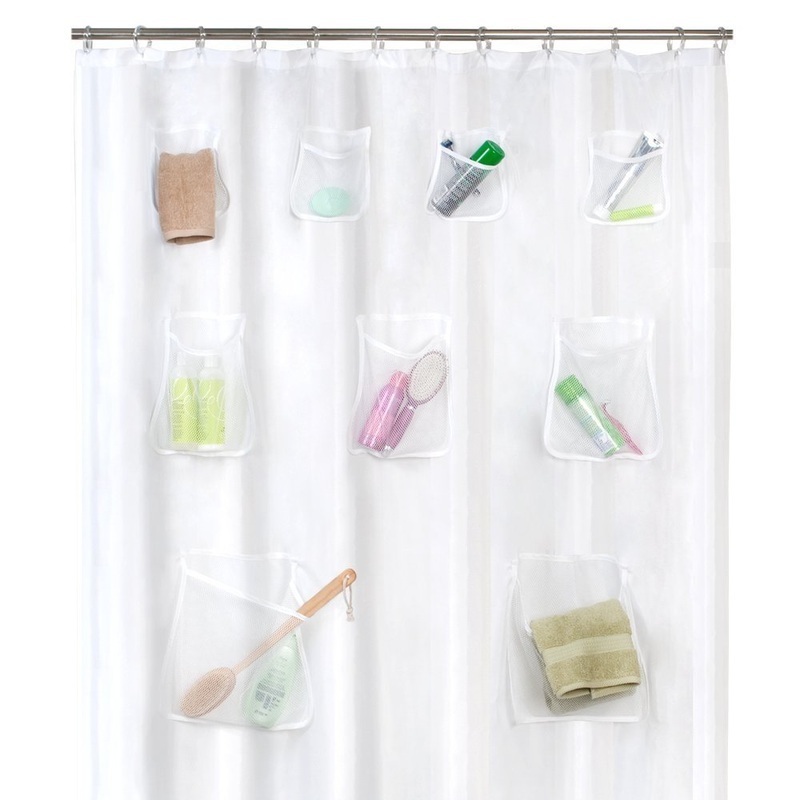 If space is really tight, I also found this really cool shower curtain with pockets for all the things you will need! 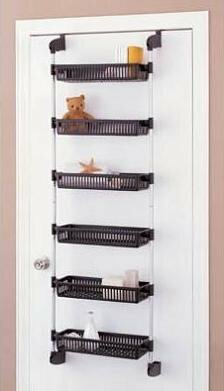 Using an over the door organizer is one of the fastest ways to create storage. It simply hangs over the door and you end up with 6 baskets to store everything from bath toys to cosmetics and more. It can be used in any room, where you can turn that little bit of space behind the door into storage. Once you close the door you have access to everything in the baskets. This is a great way to deal with bathroom clutter. If you have a very small bathroom space and really need some out of sight storage, then consider getting a sink skirt for any style pedestal sink. Also check out the page on Under Pedestal Sink Storage for more ideas. It is easy to install and is basically peel and stick and will stay stuck even after washing! This way you can get a basket and hide anything you need to store in the bathroom. 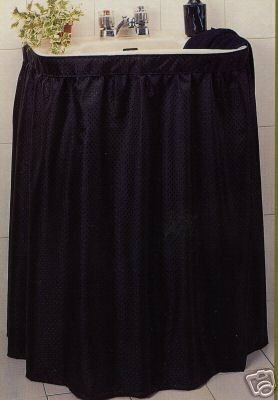 Everything from towels to appliances can be hidden behind the sink skirt. 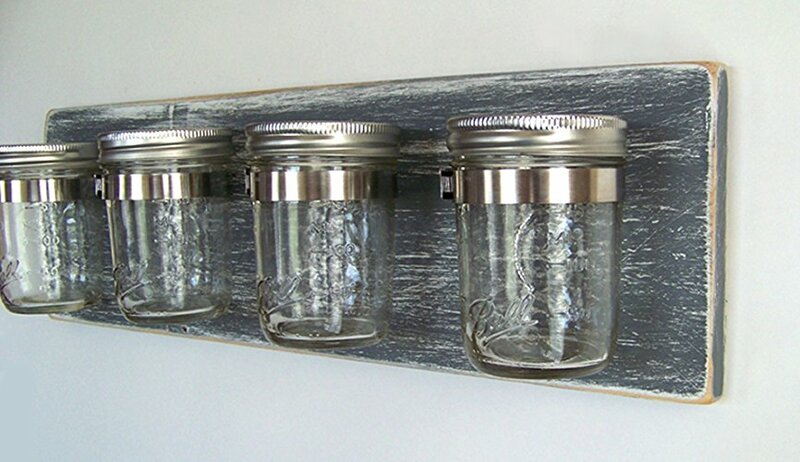 If you love the idea of recycling, you can purchase this mason jar organizer online by clicking the picture or above title, or you can do some DIY and click here to see just how to make your own! They are a quick and affordable way to store smaller items front a center where you can see them and get them off the vanity, sink or counter. Stay organized no matter the budget!